Living a Fit and Full Life: PMD - Personal Microderm Device Gives Professional Results at Home! PMD - Personal Microderm Device Gives Professional Results at Home! Microdermabrasion is not a fad. In fact, it can be traced all around the globe, as early as 1500 BC when Egyptians invented a process of using sandpaper to smooth the skin. In 1985 the first microdermabrasion machine was invented in Italy by Doctors Mattioli and Brutto. Later in 1990 microdermabrasion machines were introduced in America. With the overwhelming acceptance in Hollywood, the buzz of microdermabrasion exploded. Overall, the Personal Microderm brightens, smoothes, and evens skin tone and texture, and it reduces the appearance of fine lines and wrinkles, blemishes, and enlarged pores. Put on a fresh face with Personal Microderm, and say hello to gorgeous skin! 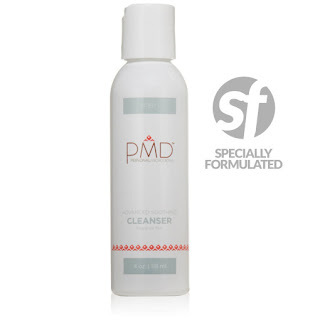 PMD Advanced Soothing Cleanser gently removes dirt and oil to clean and purify the skin. It facilitates healing and soothes the skin to reduce irritation that may occur after microdermabrasion. This cleanser is fragrance free. The Advanced Soothing Cleanser is the best cleansing option available for complimenting the Personal Microderm and purifying the skin. Formulated specifically for use prior to the Personal Microderm, this cleanser breaks down dirt and oils from within the pores and deeply removes the skin’s impurities. The Advanced Soothing Cleanser is formulated to protect the skin from the heat and intensity of the Personal Microderm by providing anti-redness, anti-itch and anti-irritation defenses, while soothing and calming the skin. The PMD Advanced Soothing Cleanser breaks down dirt and oils from within the pores and deeply removes the skin’s impurities. This cleanser is gently formulated to protect the skin from the heat and intensity of the Personal Microderm by providing anti-redness, anti-itching and anti-irritation defenses. This aids the skin’s natural healing and recovery process while soothing and calming the skin. The Advanced Soothing Cleanser is the best, most effective cleansing option available for complimenting the Personal Microderm and purifying the skin. A synergy of proven ingredients make this cleanser entirely unique. Our innovative formula has been studied, tested and proven to provide unmatched results. Thousands of hours of research and development have demonstrated the results of the Advanced Soothing Cleanser, which enhance the effects of microdermabrasion as no other skincare regimen can. Not only are the results of the cleanser perfected when paired with microderm treatments, but this innovative formula is great for daily use, as well. Overall, the results are truly undeniable. The PMD Advanced Soothing Cleanser contains Zanthalene and Zanthoxylum Bugeuanum Fruit Extracts that soothe the skin and prevent itching or irritation. Clinical testing has shown that these extracts also visibly reduce the appearance of fine lines and wrinkles. Algae Extract is an essential anti-aging ingredient included in the PMD Advanced Soothing Cleanser which supports collagen development, restores elastic quality and remineralizes the skin. It is rich in amino acids and polypeptides, which nourish the skin and supply it with renewed energy to eliminate trapped toxins and speed up cellular metabolism. Artemisia Vulgaris Extract is a mugwort plant that has been used to treat skin diseases by Chinese herbalists for thousands of years. While being anti-inflammatory, anti-itch and anti-irritation, it also is a great source of vitamin C, calcium and zinc. These key ingredients make up the synergistic formula that not only cleanses skin, but also stimulates the anti-aging benefits of the PMD Personal Microderm treatment. Toning is a vital step necessary to protect, rebalance, and revitalize the skin after a Personal Microderm treatment. Created specially for use directly following the Personal Microderm, this toner includes advanced neurogenic inflammation inhibitors to immediately begin cooling and calming irritated skin and reducing any redness that may have occurred during the microderm treatment. Formulated with a neurogenic Triple A Complex to act as an anti-sting, anti-inflammatory and astringent agent, this toner will restore pH balance to the skin and initiate its essential healing process. The Calming Neuro Neutralizing Toner uses neurogenic ingredients that soothe away inflammation and reduce redness, discomfort and heat irritation that may occur from the Personal Microderm treatment. Anti-inflammatory and anti-irritation agents stop skin-reactions immediately, leaving skin cool, radiant, and clear. The Calming Neuro Neutralizing Toner is the most effective option available for complimenting the Personal Microderm and balancing the skin’s pH levels. A synergy of proven ingredients make this toner entirely unique. Our innovative formula has been studied, tested and proven to provide unmatched results. Thousands of hours of research and development have demonstrated the results of the Calming Neuro Neutralizing Toner, which enhance the effects of microdermabrasion as no other skincare regimen can. Not only are the results of the toner perfected when paired with microderm treatments, but this innovative formula is great for daily use, as well. Overall, the results are truly undeniable. As pollutants and skin-aging free radicals attack the skin through the day, feel confident that skin is protected. The Calming Neuro Neutralizing Toner protects against dangerous free radicals, and the essential Curcurbita Pepo (Ocaline PF) ingredient that blocks the attraction of free radicals and prevents any premature aging of the skin. In addition,this toner increases the skin’s oxygen consumption by up to 50% and promotes young cell behaviour. Do more than just tighten pores; tone to condition and prepare the skin for maximized moisture absorption. Allantoin is a moisture-binding humectant element that revives damaged skin, retains essential moisture, and increases the effects of any applied moisturizers. Stimulate epithelial growth with this neuro neutralizing gene therapy ingredient, as well as eliminate excess oil and minimize pores. Days of traditional toners are in the past; neuro-restore balance to the skin for a more vibrant, luminous appearance. 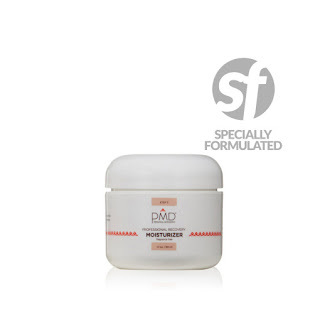 The PMD Professional Recovery Moisturizer keeps the skin smooth and hydrated after microdermabrasion. It enhances the skin's ability to quickly heal and recover while preventing premature aging. This moisturizer is fragrance free. The Professional Recovery Moisturizer is the best moisturizing option available for enhancing the results of the Personal Microderm and hydrating skin. This moisturizer promotes increased cell renewal and locks in moisture during and after the skin’s vital regeneration period immediately following microderm treatments. In addition to providing complete hydration for the skin, the Professional Recovery Moisturizer facilitates the skin’s healing and recovery process, promotes elasticity and firmness, increases collagen production by more than 50%, decreases wrinkle volume between 31% and 100%, and reduces the development of dark spots and age spots by up to 30%. The Professional Recovery Moisturizer is the most advanced and effective moisturizing option for skincare regimens that include microdermabrasion. Expect professional-grade results and youthful, bright, and rejuvenated skin. The Professional Recovery Moisturizer uses Gene-Therapy ingredients that stimulate the skin’s collagen and elastin production. This moisturizer unlocks the skin’s regenerative nature to firm and tighten the skin. Clinical tests on these ingredients alone have shown an increase in collagen production by 50%. Gene-Therapy ingredients have been proven to significantly decrease wrinkle volume. These ingredients stimulate young cell behavior and fill in fine lines and wrinkles from the inside out. Within the lab, this ingredient formula has not only been proven to reduce wrinkles, but eliminate them entirely. Reverse the appearance of discolorations with maximum strength brightening agents, without any side effects. Santalum Album and Phellodenreon Amurense not only reduce the development of dark spots by up to 30%, but when combined with the powerful antioxidants present in the moisturizer, they help to prevent the appearance of future hyperpigmentation. The Professional Recovery Moisturizer is the most effective option available for complimenting the Personal Microderm and healing the skin. A synergy of proven ingredients make this moisturizer entirely unique. Our innovative formula has been studied, tested and proven to provide unmatched results. Thousands of hours of research and development have demonstrated the results of the Professional Recovery Moisturizer, which enhance the effects of microdermabrasion as no other skincare regimen can. Not only are the results of the moisturizer perfected when paired with microderm treatments, but this innovative formula is great for daily use, as well. Overall, the results are truly undeniable. Coralline Officinalis Extract acts as an inflammatory mediator to soothe the skin, reduce redness and increase cellular cohesion. This extract concentrates the power of sea water micronutrients by 200,000 times, and this serves to strengthen and restore skin on the cellular level. Corlline Officinalis Extract is an intelligent ingredient that specifically targets dry spots and irritation and helps to fortify the skin and lock in essential moisture for up to 24 hours. Ellagi-C increases cell renewal and improves the skin’s overall healing and recovery process. This ingredient reverses the signs of aging by repairing wrinkles and enhancing damaged skin’s ability to quickly heal and recover. It also increases vitamin C absorption, helping to prevent premature aging and visibly decreasing wrinkle size and depth. Synthe 6 Matrixyl is a Gene-Therapy ingredient that stimulates the skin’s collagen and elastin production and unlocks the skin’s regenerative nature to not only fill in wrinkles, but to firm and tighten the skin, as well. This ingredient acts as a natural filler, and with continued use, it eliminates the need for cosmetic injections. PMD - Personal Microderm Device Gives Professional Results at Home! It honestly does! My skin was beginning to look dull and well... old. I'm in my early 30's and was starting to think that that was just what my skin was going to look like now. I've heard a lot about microderm abrasion and honestly considered having it done professionally after seeing a friend post about it on Facebook and her skin looked amazing. Well, after one use of the PMD I'm glad I didn't pay to have it done because I got the same results at home with the PMD. My skin was a little red after each use but I used the Advanced Soothing Cleanser, Neuro Neutralizing Toner and the Professional Recovery Moisturizer by PMD and my skin stayed hydrated and seemed to heal quickly. I always though that microderm abrasion would be pretty painful but it felt like a sunburn and honestly didn't bother me at all. The results are absolutely incredible and I love that I can keep my healthy skin by using the PMD device once a week. I also like that I don't have to make an appointment or pay for someone else to give me those results. The PMD is an absolutely wonderful product and I think everyone who wants glowing healthy skin should own one! Click HERE to learn more about PMD! Follow PMD on social media!